UMPI’s Valentine Degiovanni picked up Rookie of the Week honors in the North Atlantic Conference for the second consecutive week. PRESQUE ISLE, Maine — UMPI’s Valentine Degiovanni picked up Rookie of the Week honors in the North Atlantic Conference for the second consecutive week. 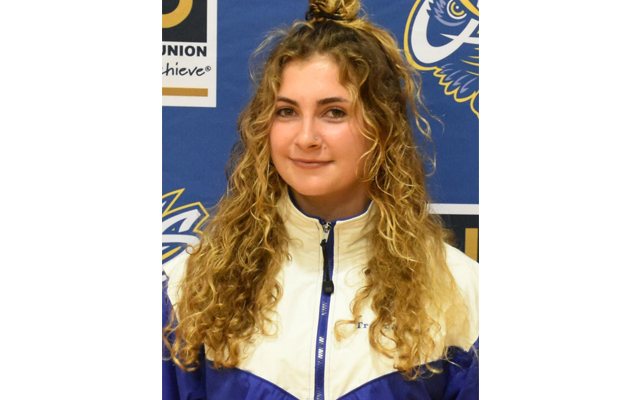 It was an easy choice as Degiovanni, a freshman from Nice, France, picked up her second individual win in as many races to begin her cross country career at UMPI. Degiovanni led the Mariner Invitational in Belfast from wire to wire on Sept. 8 and completed the five-kilometer course in 20 minutes and 54 seconds, which was an improvement of 1:42 from the previous week. She was nearly a minute ahead of the meet runner-up, Julia Glisson of Husson University. Degiovanni also had been named NAC Runner of the Week for the week ending Sept. 2.